I need to ease back into things here. I’ll start with this simple, delicious salad—a recipe I’ve set aside for a long time. My mom grew these beautiful tomatoes this summer and I carefully carried them with me on the plane, hoping not to bruise them. This isn’t a complicated recipe and I think it goes without saying that the quality of tomatoes you use will make all the difference. The onions are soaked in water for 5 minutes and will mellow out wonderfully. I made this twice in the last couple of days and the onions taste better and soak up more of the dressing if they are finely chopped (more than in the photo). The shiso… well, what can I say about it that I haven’t already said. I love it. The dressing is salty and tart and goes perfectly with a slice of the juicy, sweet tomato. Hope you give it a try. Remove the stem from the tomato and slice 3/8″ thick. Finely chop the onion and shiso and place in separate bowls of water and let soak for 5 minutes. Combine the sesame oil, shoyu, vinegar, and ground pepper in a small bowl and set aside. Drain the onion and shiso separately and pat dry. 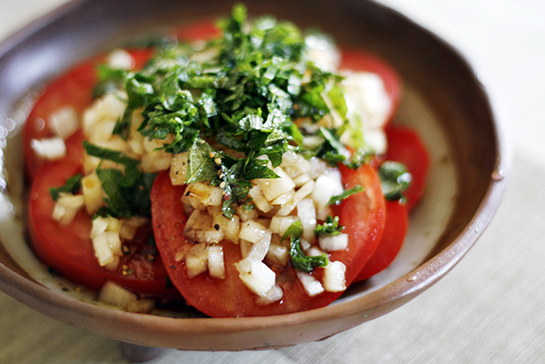 Put the tomato on a plate, top with onion, then shiso, and drizzle dressing. This entry was posted in Contemporary Recipes, Salads, Vegetables and tagged japanese, onion, quick, salad, shiso, tomato, vegan, vegetarian. Bookmark the permalink. Post a comment or leave a trackback: Trackback URL. I’m so glad you’re putting up posts again! I’ve been checking off and on these months cuz I love your other recipes! I just made the tuna chirashi tonight (3rd time now) and I’ve made your bacon shiso rice about 4 times now! I was bummed when you stopped posting! Welcome back! Thank you, chamindika! It’s funny, I didn’t think anyone noticed I took a little absence, but it’s nice to know I was missed! Thank you for cooking along with me and for your kind compliments. I’ll be sure do more posting! Thanks, Mary! And what are you talking about?! I’ve been following your travels to the Bay. I LOVE Bakesale Betty, btw. Yum! Azusa, I have had this salad today as a pre-dinner snack. It was extraordinary. I loved the combination of all the ingredients and even though I usually tend to modify each recipe, I’ll leave this one intact (I only used a small shallot, I didn’t have the “standard” onion). It was perfect, simple and sophisticated. Thank you for sharing it! Sissi, I’m glad you enjoyed this! I can’t wait to make this again, now that tomatoes are back in season. I’m equally hooked on shiso—hope to try your recipe soon! Great salad, clean & astringent taste. I added some finely sliced lettuce as a bed under, and used it to accompany Chicken Katsu with Curry Sauce (Japan’s take on the schnitzel). Many thanks for the recipe.